JBL PondEnergil is a high-energy, easily digested feed for koi and all other garden pond fish at low temperatures under 15�C. JBL PondEnergil contains processed fish oil which ideally meets the fishes� need for energy and unsaturated fatty acids which is greater at these temperatures. 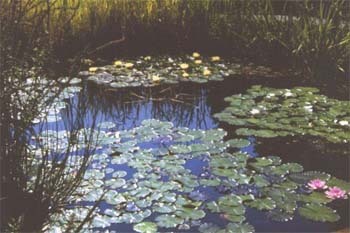 The reduced protein content and high level of digestibility prevent unnecessary pollution of the delicate pond biotope. Vital vitamins increase resistance to disease. Since fish rarely rise to the surface of the water at temperatures under 15�C, JBL PondEnergil was designed as small sinking sticks in order to be able to give specific small amounts of feed. JBL PondVario is a mixture of high-grade flake feed and untreated, dried water fleas. It contains a balanced mixture of all the essential ingredients such as proteins, carbohydrates, fibre and fats required by garden pond fish in the warmer months. Vital vitamins increase resistance to diseases. Composition: Cereal, crustacea (20%), bakery products, fish and fish byproducts, vegetable plant extracts, yeast, algae. JBL PondSticks contain a special balanced mixture of essential animal and vegetable materials, which exactly meet the nutritional requirements of all garden pond fish in the warmer months. High-grade plant fibre and vital vitamins promote a healthy digestive system and strengthen resistance to disease. JBL PondSticks do not cloud the water and are highly buoyant, enabling you to check the amount of feed consumed. Composition:Cereal, fish and fish by-products, vegetables, crustacea. JBL PondNatur is a mixture of untreated, dried water fleas and other crustaceans which all garden pond fish enjoy eating as a treat or as a tasty change to their diet. JBL COLORON is a mixture of various sticks designed to meet the requirements of koi and other garden pond fish. A specially balanced combination of high grade natural raw materials and plant extracts enhance the natural brilliant colouring of all pond fish. Vital vitamins increase resistance to disease. Composition: Fish and fish byproducts, cereals, vegetables, crustacea, algae. JBL PondPerls KOI:The nutrient content and shape of JBL PondPerls KOI is designed to specifically meet the feeding requirements of young, growing koi in garden ponds. High grade vegetable and animal raw materials, as well as plant fibre and vital vitamins guarantee healthy growth, enhance the natural brilliant colouring and increase resistance to disease. Composition: Fish and fish by-products, cereals, crustacea, plant by-products, algae. JBL PondSticks KOI:The nutrient content and shape of JBL PondSticks KOI is designed to specifically meet the feeding requirements of koi in garden ponds. High grade vegetable and animal raw materials, as well as plant fibre and vital vitamins guarantee healthy growth, enhance the natural brilliant colouring and increase resistance to disease. JBL Aqualon for biological pond water protects the mucous membrane. Aqualon immediately converts tap or rain water into biotope pond water. JBL AccliPond provides valuable vitamins and plant extracts, which contribute to a strengthening of the immune system of the pond fish. It therefore helps preventing diseases and stress especially in the critical interseasonal periods spring and autumn. JSL Clerolon is a water-clarifier, which removes micro-sized cloudiness, e.g. water bloom, cloudiness caused by bacteria etc. JBL Bactolon regulates sludge and harmful substances. Highly concentrated, useful micro-organisms in Bactolon ensure the preservation of health of the pond water by a selective decomposition of sludge and harmful substances and therefore create most favourable living conditions for fish and plants. JBL Algolon fights algae in a most effective way by selective algaecides. Does not contain copper. JBL Humovit - peat extract with active iodine and vital substances, prevents excessive algae growth and increases the resistance of the fish in the garden pond. JBL Humolon peat tablets naturally impede excessive algae growth in the garden pond. The effect of these valuable peat extracts, which impede algae growth but are completely harmless for higher plants, is supported additionally by a slight brown coloration of the water. JBL ProPond 6 active peat granulate material for 6000 litres as biological algae prevention in the garden pond. JBL AciIon reduces excessively high pH-levels in the garden pond. If the pH-level is too high, ammonium, which is generated by the decomposition of left-overfeed and plant remnants as well as fish excrement, converts into ammonia which has a highly toxic effect on the fishes. This is why a pH-level of about 7.5 is desirable. JBL AlkalonCombi increases the carbonate hardness and stabilises the pH value. Converts rain water into biotope pond water. Binds heavy metals and is beneficial to the health of the fish skin due to protecting colloids and vital substances. Provides the most favourable conditions for fish and plants in the pond. JBL Oxylon oxygen tablets provide the essential oxygen for all garden pond fish. 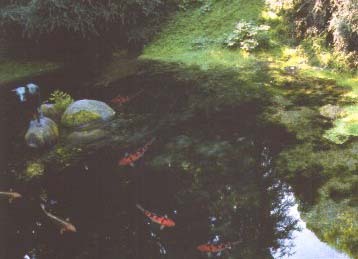 A sufficient oxygen level in the garden pond supports the respiration of the fish and important bacterial cleaning processes, therefore providing healthy water conditions. Especially on hot summer days or in winter there may be insufficient oxygen. This can be easily remedied using JBL Oxylon oxygen tablets. JBL Ferolon, complete fertiliser with iron and trace elements, contains a combination of important nutrients, iron and trace elements, designed to specifically meet the requirements of pond plants. JBL Medolon fights effectively against �mycelium� and skin parasites, such as ichthyophthirius, costia and trichodina. Skin injuries and �fin rot� also heal within a short period of time. Signs of healing can usually be seen after only 24 hours. Water plants are not harmed and the discoloration of the water disappears after a short period of time. JBL FuraPond against internal and external bacterial infections of koi and other garden pond fish.